Giant Sign has been in business over 30 years and it is still going strong! Prepare The Way Ministries in Dallas, like this one, used a lighted channel letters mounted on fascia, in which we design the letters and put the letters up on the wall. Interested in starting a business, but you have no idea how to or where to inquire for a sign? Giant Sign is a place for you! Give us a call for free consultation at (972)-247-4404. Giant Sign has been in business over 30 years and it is still going strong! Coffee Holic in Lewisville, like this one, used a lighted channel letters on raceway, in which we design the letters and put the letters up on the wall. Interested in starting a business, but you have no idea how to or where to inquire for a sign? Giant Sign is a place for you! Give us a call for free consultation at (972)-247-4404. Giant Sign has been in business over 30 years and it is still going strong! Arirang Korean Restaurant in Carrollton, like this one, used a lighted channel letters on raceway, in which we design the letters and put the letters up on the wall. Interested in starting a business, but you have no idea how to or where to inquire for a sign? Giant Sign is a place for you! Give us a call for free consultation at (972)-247-4404. Giant Sign has been in business over 30 years and it is still going strong! Relax The Back, like this one, used a lighted channel letters on backplate , in which we design the letters and put the letters up on the wall. Interested in starting a business, but you have no idea how to or where to inquire for a sign? Giant Sign is a place for you! Give us a call for free consultation at(972)-247-4404. Giant Sign has been in business over 30 years and it is still going strong! Jimmy John’s, like this one, used a lighted channel letters on square tubing and non illuminated blade sign, in which we design the letters and put the letters up on the wall. Interested in starting a business, but you have no idea how to or where to inquire for a sign? Giant Sign is a place for you! Give us a call for free consultation at (972)-247-4404. Giant Sign has been in business over 30 years and it is still going strong! Roosteria, like this one, used a lighted channel letters mounted on fascia, in which we design the letters and put the letters up on the wall. Interested in starting a business, but you have no idea how to or where to inquire for a sign? Giant Sign is a place for you! Give us a call for free consultation at (972)-247-4404. Giant Sign has been in business over 30 years and it is still going strong! Anthony’s Eatalian, like this one, used a lighted channel letters mounted on fascia, in which we design the letters and put the letters up on the wall. Interested in starting a business, but you have no idea how to or where to inquire for a sign? Giant Sign is a place for you! Give us a call for free consultation at (972)-247-4404. Giant Sign has been in business over 20 years and it is still going strong! Phamacare Drug (Seoul Phamacy), like this one, used a lighted channel letters on backplate , in which we design the letters and put the letters up on the wall. Interested in starting a business, but you have no idea how to or where to inquire for a sign? Giant Sign is a place for you! Give us a call for free consultation at (972)-247-4404. Giant Sign has been in business over 20 years and it is still going strong! Viceroy Indian Restaurant, like this one, used a lighted channel letters on raceway, in which we design the letters and put the letters up on the wall. Interested in starting a business, but you have no idea how to or where to inquire for a sign? Giant Sign is a place for you! Give us a call for free consultation at (972)-247-4404. Giant Sign has been in business over 30 years and it is still going strong! 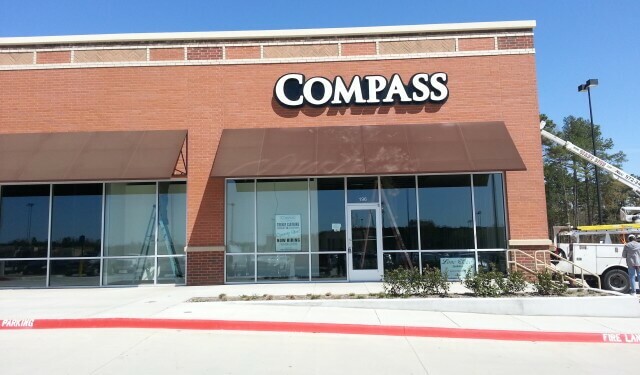 Compass in Tyler, like this one, used a lighted channel letters on backplate , in which we design the letters and put the letters up on the wall. Interested in starting a business, but you have no idea how to or where to inquire for a sign? Giant Sign is a place for you! Give us a call for free consultation at (972)-247-4404.